American physicist who twice was cowinner of the Nobel Prize for Physics (1956 and 1972) for his work contributing to the invention of the transistor, and for developments in the theory of superconductors. I can’t work well under the conditions at Bell Labs. Walter [Brattain] and I are looking at a few questions relating to point-contact transistors, but [William] Shockley keeps all the interesting problems for himself. From conversation with Frederick Seitz as quoted in Lillian Hoddeson, 'John Bardeen: A Place to Win Two Nobel Prizes and Make a Hole in One', collected in Lillian Hoddeson (ed. ), No Boundaries: University of Illinois Vignettes (2004), Chap. 16, 242. I think my most important work has been done on the borderlines between different areas of science. My first work was in geophysics, a combination of physics and geology, and then at the Bell Laboratories, it was more a combination of physics and electrical engineering. That’s what I’m following more or less as time goes on. My appointment here at the university relates to physics and electrical engineering, but I have also worked in the borderline areas between physics and chemistry. I think reading widely and being interested in many different areas in science is important. In Robert L. Burtch, 'Interview with a Nobel Laureate: Fifth Graders Learn About a Scientist We All Should Know', Science and Children, (Nov/Dec 1990), 28, No. 3, 16-17. Science is a collaborative effort. The combined results of several people working together is often much more effective than could be that of an individual scientist working alone. From his second Nobel Prize Banquet speech (10 Dec 1972). In Wilhelm Odelberg (ed. ), Les Prix Nobel en 1972 (1973). 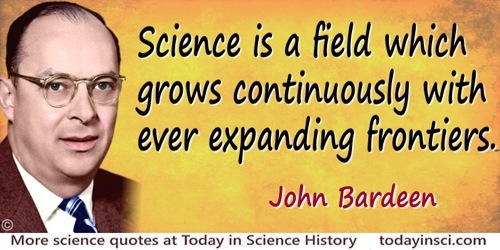 Science is a field which grows continuously with ever expanding frontiers. Further, it is truly international in scope. … Science is a collaborative effort. The combined results of several people working together is often much more effective than could be that of an individual scientist working alone. On the morning of 1 November 1956 the US physicist John Bardeen dropped the frying-pan of eggs that he was cooking for breakfast, scattering its contents on the kitchen floor. He had just heard that he had won the Nobel Prize for Physics along with William Shockley and Walter Brattain for their invention of the transistor. That evening Bardeen was startled again, this time by a parade of his colleagues from the University of Illinois marching to the door of his home bearing champagne and singing “For He’s a Jolly Good Fellow”. In Abstract for 'John Bardeen: An Extraordinary Physicist', Physics World (2008), 21, No. 4, 22. John Bardeen was an avid golfer and a good one. Whenever possible, he sought out golf courses during research or consulting trips. According to the stories, he was as proud of hitting a “hole in one” as he was to win a second Nobel Prize. In 'John Bardeen: A Place to Win Two Nobel Prizes and Make a Hole in One', collected in Lillian Hoddeson (ed. ), No Boundaries: University of Illinois Vignettes (2004), Chap. 16, 257. 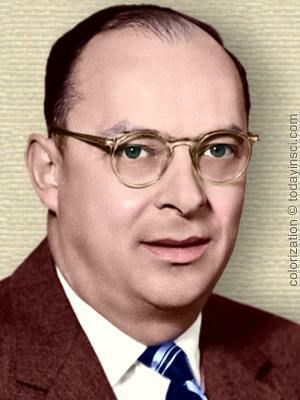 23 May - short biography, births, deaths and events on date of Bardeen's birth. True Genius: The Life And Science Of John Bardeen, by Lillian Hoddeson. - book suggestion.